Netflix and Comcast have reached a deal to speed up streaming for Comcast customers. But the real question is how much it's going to cost. Late last week, a few observant -- and tech-savvy -- Netflix (NASDAQ:NFLX) users noticed that something had changed in how they were receiving Netflix streaming video. It appeared Netflix was now exchanging traffic directly with Comcast (NASDAQ:CMCSA) in what is called a "peering" arrangement. This was noteworthy because Netflix users with Comcast Internet had experienced deteriorating performance recently. Poor Netflix streaming quality was becoming a flashpoint in the net neutrality debate. Some people feared that ISPs like Comcast would use their market power to disrupt services like Netflix in order to keep users attached to their cable TV subscriptions. Netflix just removed one potential business risk, but at what cost? On Sunday, Netflix and Comcast issued a press release confirming that they had established a more direct connection to improve Netflix streams. This arrangement will help Netflix and Comcast by mitigating risks for both companies. However, the financial impact of the deal will be hard to assess until Netflix reports its Q1 results and provides new cost guidance. While Comcast and Netflix stated in their press release that they've been working together on this solution for many months, it's no surprise a deal got done now. Both companies have very good reasons for coming to a long-term agreement that allows Comcast Internet subscribers to get good-quality Netflix streams. The crux of the problem can be seen in the following graph. Comcast and Verizon streaming throughput has been deteriorating. Source: Netflix. Over the past year, streaming performance has continuously improved for customers of Cablevision, which uses Netflix's "Open Connect" system to improve streaming throughput. By contrast, Comcast and Verizon Internet subscribers have seen decaying streaming speeds in the last few months. By January, Comcast's average throughput had deteriorated nearly to the level that Verizon DSL subscribers had achieved a few months earlier. Many Comcast customers and public interest groups accused Comcast of foul play. From Comcast's perspective, getting a deal done with Netflix was essential in light of the company's plans to buy No. 2 cable operator Time Warner Cable. Regulators are sure to scrutinize the purchase carefully. Now that Comcast has a long-term agreement in place specifying how it will carry Netflix traffic, regulators may be less concerned that Comcast will slow or block Netflix traffic to protect its cable TV business. From Netflix's perspective, it was important to reach a deal with Comcast as soon as possible, too -- before frustrated customers started dropping their Netflix service. Netflix is likely paying more for its new arrangement with Comcast than it did when using third parties to deliver its traffic to Comcast; one analyst estimated that Netflix will now pay $25 million to $50 million annually. Just last month, Netflix CEO Reed Hastings told investors that ISPs wouldn't slow down Netflix streams because their customers would protest such a move. This seemed to imply he wasn't willing to pay Comcast at all for the privilege of sending traffic over its network. The problem is that one of Netflix's big selling points is that it "just works." Netflix customers don't want to become leverage in a battle between Comcast and Netflix -- they just want Netflix to work. Thus, it's worth it for Netflix to pay extra if it can guarantee better service. After bouncing around the flat line early Monday morning, Netflix shares shot higher during the day to set a new all-time high just below $450. While the deal with Comcast helps Netflix by removing the risk of subscribers getting frustrated with low-quality video, investors shouldn't necessarily pop the champagne cork. Netflix stock, 2013-present. Source: YCharts. As I have highlighted in a series of articles here, Netflix investors seem to be underestimating the probability that cost increases will continue to nearly mirror revenue growth. Netflix has made it clear that content costs will keep rising rapidly as the company continues to invest in original and exclusive content. The company also plans a rapid international expansion starting later this year, a process it calls "expensive." Whatever the cost of the Netflix-Comcast arrangement, it's unlikely to stop Netflix from growing its profit rapidly over the next five years. 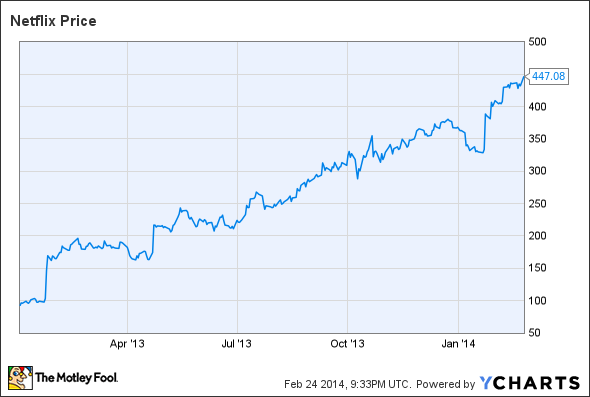 However, investors need to think about just how fast Netflix will grow its profit. The difference between growing EPS tenfold to $20 by 2018 or growing EPS "only" fivefold to $10 could be the difference between Netflix stock being worth $500 today and it being worth $250 or less. Netflix's April earnings report should provide some more detail about how the new arrangement with Comcast will affect Netflix's costs. Netflix shareholders should hold off on celebrating until they get that information.